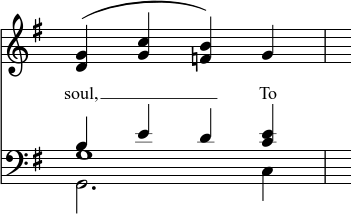 When a text object is created in MuseScore, it assumes the corresponding Text Style: all staff text, for example, has a unique Text Style, as have tempo markings, dynamics, chord symbols etc. Each Text Style consists of a number of text properties (font-face, font-size, font-style etc. 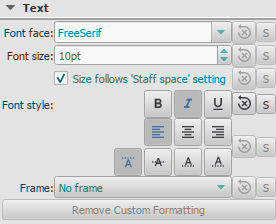 ), which can be viewed, mainly, in the Text Styles dialog (Format→Style…→Text Styles). However, these text properties are not limited to those of the default Text Style: if need be, you can edit them in the Inspector independently of Text Style. Finally, if you want to apply formatting to specific characters in a text object (font-face, font-size, Bold, Italic, Underline, superscript, subscript), you can do so in text edit mode. Select the object and adjust the X or Y offset values in the Inspector. Select a note or rest; then for Staff text, press Ctrl+T; or for System text, press Shift+Ctrl+T. Select a note or rest; then select the desired option from Add→Text. Select a note or rest, then double click the desired text from a palette. Drag the desired text from a palette onto a note or rest. This will create an empty bounding box for text entry. Press Esc or click on an empty space outside the box to exit. Apart from their indicative use, staff and system text also have optional playback properties: see below. Staff Text is applied to one staff (or Grand staff) in the score, and is indicative only for that staff; any playback effect associated with the text is limited in the same way. The text will appear in the corresponding instrument part. If you choose to hide empty staves, any staff text belonging to an empty staff will also be hidden. Staff text can, for example, be used to apply indications such as Solo or Pizzicato to one staff in a score. Depending on what the instructions of the staff text are, MIDI playback of that staff at the text location can be altered to match the instructions by right-clicking on the staff text and selecting Staff Text Properties…. See Mid-staff sound change. Right-click on the text and chose "Staff Text properties," then click on the relevant tab. System text is applied to one staff in the score, but is indicative for every staff in the system. Any associated playback properties are applied to the whole system. The text will appear in all instrument parts. System text is never hidden by the hide empty staves feature. Right-click on the text and chose System Text properties, then click on the Swing Settings tab. Root note: A, B, C, D, E, F, G.
Flat: b (small letter "b"). Double sharp: x (small letter "x") or ## (two hash symbols). Double flat: bb (small letter "b" twice). Natural: natural (no space before "natural"). For other symbols, see Chord symbol syntax (below). 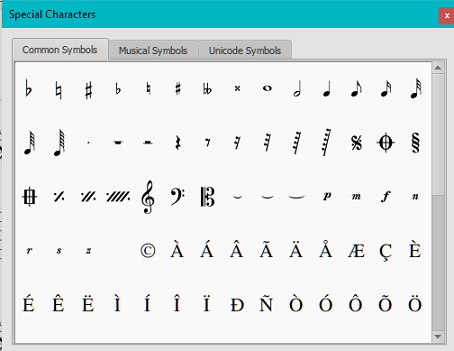 When you exit the chord symbol, the characters you have typed will automatically assume the correct format: by default a root note typed in lower case will turn into upper case (for alternative options, see Automatic Capitalization); a "#" or "b" will turn into a proper sharp (♯) or flat (♭) and so on. Do not try to use actual flat and sharp signs as MuseScore will not understand those properly. Move the cursor forward or backwards to continue entering or editing chord symbols (see commands below). Exit chord symbol mode by pressing Esc. Note: To fill measures with slashes, see Fill with slashes or Toggle rhythmic slash notation. Half-diminished: ø (type 0, zero). Alternatively, you can, of course, chose abbreviations such as mi7b5 etc. The following abbreviations are also valid: extensions and alterations like b9 or #5, sus, alt, and no3; inversions and slash chords, such as C7/E; commas; parentheses, which can enclose part, or even all, of a chord symbol. 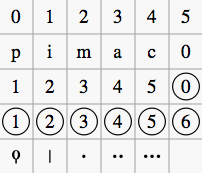 An existing chord symbol can be edited in a similar way to ordinary text: See Text editing. Chord symbols are automatically transposed by default if you apply the menu Transpose command to the containing measures. If this is not required, you can untick the "Transpose chord symbols" option in the same dialog. From the main menu, chose Format → Style → Text Styles → Chord Symbol. Then edit the text properties as required. Select a chord symbol and make changes in the Inspector, pressing the "Set as style" buttons as you go. Three options are possible: Standard and Jazz and Custom. You can select between these using the radio buttons. In the Standard style, chords are rendered simply, with the font determined by your chord symbol text style. In the Jazz style, the MuseJazz font is used for a handwritten look, with distinctive superscript and other formatting characteristics. The Jazz style is selected by default if you use any of the Jazz templates. The Custom style option allows you to customise the look of chord symbols (and also ensures compatibility with older scores). 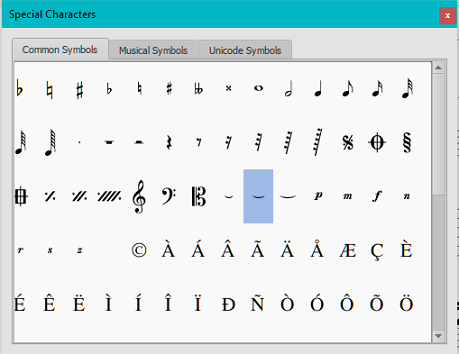 Select a customised Chord symbols style file in the field below: this can be created by copying and modifying one of the pre-existing files in the "styles" folder. Documentation can be found in the same folder. Note, however, that this is for advanced users only, and there is no guarantee these files will be supported in the future. You can also turn off the automatic capitalization completely, in which case note names are simply rendered the way you type them. Distance to fretboard diagram: If a fretboard diagram is present, this value is the height at which the chord symbol is applied above the diagram (negative values can be used). Minimum chord spacing: The space to leave between chord symbols. Maximum barline distance: Changes the size of the gap between the last chord symbol in the measure and the following barline. You only need to adjust this value if there is a continuous problem in the score with overlap between the last symbol in one measure and the first symbol in the next. Note: In addition to the settings described here, the default position of applied chord symbols is also determined by settings in the Text Styles dialog. The effect is cumulative. Enter the number of the capo position at which you want to display substitute chords, in brackets, after all chord symbols in the score. Go to the next syllable: Press Space (or Ctrl+→) at the end of a syllable. Hyphen (to connect syllables): Press - at the end of a syllable. Go to the previous syllable: Press Shift+Space (or Ctrl+←). Move left: Press ← (left arrow). If the cursor is at the beginning of a syllable, it will jump to the previous one. Move right: Press → (right arrow). If the cursor is at the end of a syllable, it will jump to the next one. Move to the syllable below: Press ↓ (down arrow). Move to the syllable above: Press ↑ (up arrow). Start new lyrics line: Press ↵ (Return) at the end of an existing lyrics syllable (Note: Don't use the Enter key from the numeric keypad!). To exit lyrics mode, press Esc. Select the note where you want to start the new lyrics line. Enter lyrics mode as shown in step 3 (above). The cursor moves to a new (blank) line. Enter text edit mode on an existing syllable, go to the end of the syllable and press ↵ (Return). The cursor moves to the next line. Continue entering lyrics from step 4 (above). Character space: Ctrl+Space (Mac: ⌥+Space). - (hyphen): Ctrl+- (Mac: ⌥+-) or AltGr+-. Line feed: Ctrl+↵ (Mac: ⌥+Return) or Enter (from the numeric keypad). To number verses, simply type the number (e.g. 1.) and a space before the first syllable. MuseScore will automatically align the numbers and first syllable correctly. At the end of the word, press Shift+___. Type the letters To, then press Esc. For non-last syllables to extend, just use additional dashes -, usually only one of them will show (more when the distance between the syllables is large enough), and the syllable will right-align to the first note, similar to last syllables that got notated with a melisma, see above. Double-click the elision slur found after the 7/8 fraction in the "Common Symbols" tab (next to last character in the image above). Depending on the font, add one or more spaces before/after the slur using Ctrl+Space (Mac: ⌥+Space). Note: Not all fonts include the "undertie" character (U+203F ‿ "undertie", present in "Special Characters" mainly for compatibility with MuseScore 1.x scores). To find out which fonts on your computer support it, see "fontlist" (look for any font that shows a tie between "te" and "A" instead of a blank rectangle). Continue entering lyrics (see above); or exit lyrics mode by pressing Esc. Edit Placement, Line height, Margins, Dash and Melisma properties as required. 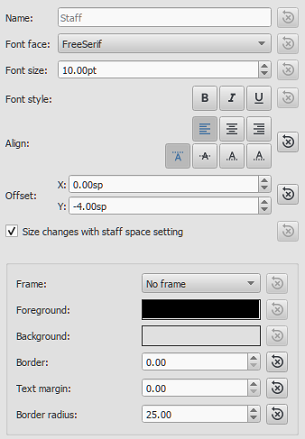 Adjust the X and Y offsets in the Inspector. From the menu bar, select Tools→Copy Lyrics to Clipboard. Enter the notes in the score to which the lyrics will be attached. Set up your lyrics in a text file, with appropriate spaces, hyphens, line-breaks etc. Copy the lyrics from the text-file into the clipboard. Select the start note in MuseScore, and press Ctrl+L (Mac: Cmd+L) (step 3 under Enter lyrics in a score). Repeatedly applying paste will enter successive words of the lyrics. You may need to enter melismas and make other corrections as you go along.